Who says you have to choose only one kind of bacon? That's just ridiculous. You should be able to try every flavor! The Bacon Freak Bacon of the Month Club delivers 2 different packs of bacon to your door every month. Yes it's true. No need to pinch yourself; you're not dreaming. Imagine getting gourmet bacon delivered to your door. Yeah, we've read your mind and we're bringing you the bacon. Hog heaven is right here, in this bacon-tastic club. 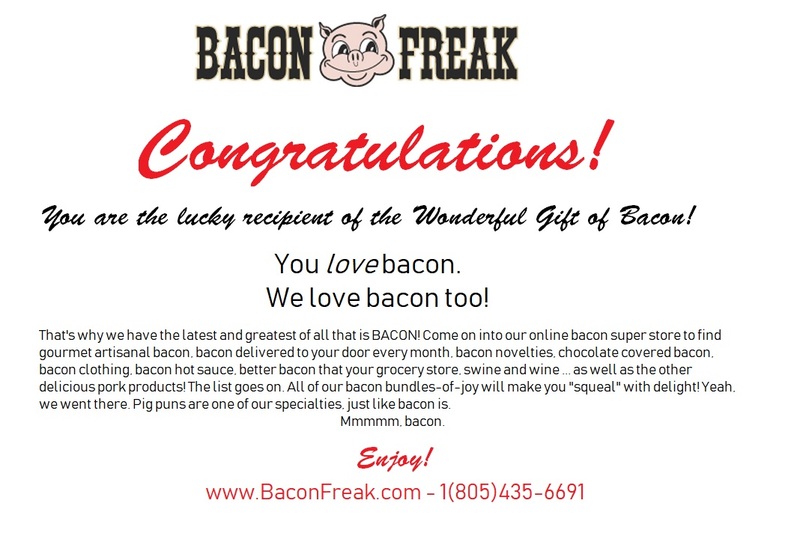 The Bacon Freak Bacon of the Month Club gives you fantastic, high quality artisan bacon delivered to your door. Our bacon is hand-rubbed with spices like Cajun, Apple Cinnamon, Jalapeno, Honey BBQ, Maple, Brown Sugar, Everything but the kitchen sink, Sun-Dried Tomato, Pepper, and good ol' Hickory Smoked. It's cured in a traditional method, so when you cook a pound of bacon, you get a pound of bacon. It doesn't shrink and splatter when you cook it. •2 different packs (14-16 oz. each) of artisan bacon delivered each month for 3 months, $149.75; 6 months, $292.95; or 12 months, $499.95 (Best Value). •A fun and stylish "Bacon is Meat Candy™" t-shirt. Indicate your shirt size using the drop down box above. •Gift Box on first month's shipment. You can add a gift message in "Order Comments" at checkout on the shipping page. You know what else makes Bacon Freak™ so awesome? Our bacon products have been featured on FOX, NBC, ABC, the Travel Channel, USA Today, Sports Illustrated, People magazine, and Maxim magazine. Everyone wants in on our bacon, so get yours today! How will you receive all of your goodies? Items purchased from the store can be added to the monthly subscription delivery to save you shipping charges. Just add your club order number in the "Order Comment" section at checkout and we will refund the shipping charges for the additional item. Call customer service with further questions. So... I love bacon... who doesn't. It's the best thing ever!And I love bacon that I get from local stores. For a long time I wondered... how much better can specialty bacon be? Well I decided to treat myself and find out. I joined the bacon of the month club for a year. And now I'm addicted. The bacon is outstanding! So much variety and different flavors.... they are unique and exciting. Opening my box each month feels like Christmas morning... can't wait to see what I've gotten. The only thing better is eating it. Super YUM! It's happiness in a monthly box. I heard about bacon delivered to your door and I had to gift it! Without a doubt, the best bacon I have ever had........where have you been my whole life? This was an awesome gift for my husband. The bacon was great, and he loved the shirt! Super stoked to receive this gift. fast delivery, perfect gift for my brother in law. Funny site and good product! Anything that puts a big grin on my father-in-law's face is a winner for me. Anything that puts a big grin on my father-in-law's face is a winner for me. Your bacon deliveries do that for us. He loves preparing the bacon and letting us know how much he enjoys it. Sometimes, he even shares! Thanks for smiles and full tummies.